This will be the main post for devlogs of the game. In which will be every Tuesday. "Electricity" will be used to generate power to elements of the house (fridge, lights,workshop…) and can be produced using either solar panels or burning charcoal in the (charcoal burner) also can be used in producing heat. "Food" is the main resource to maintain the character’s Hunger attribute, it’s used to prepare meals using the fridge, can be obtained by harvesting the plants in the garden. 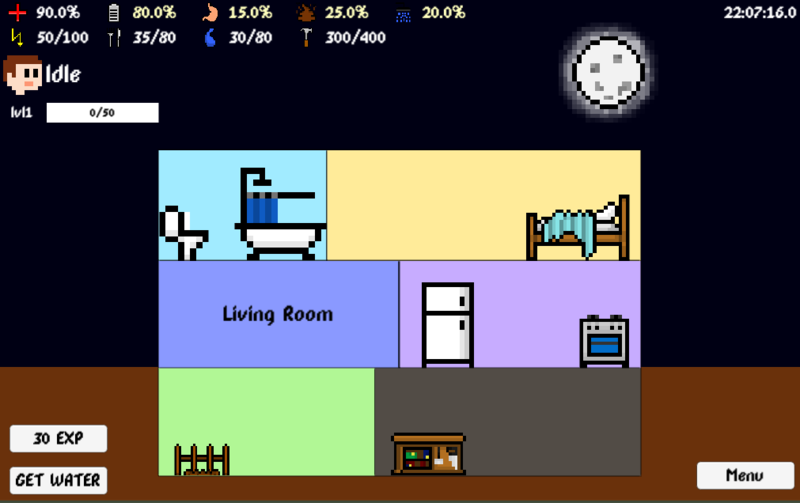 "Water" is an essential resource for using the bathroom utilities , can be obtained by using bucket in the roof to collect rain water. 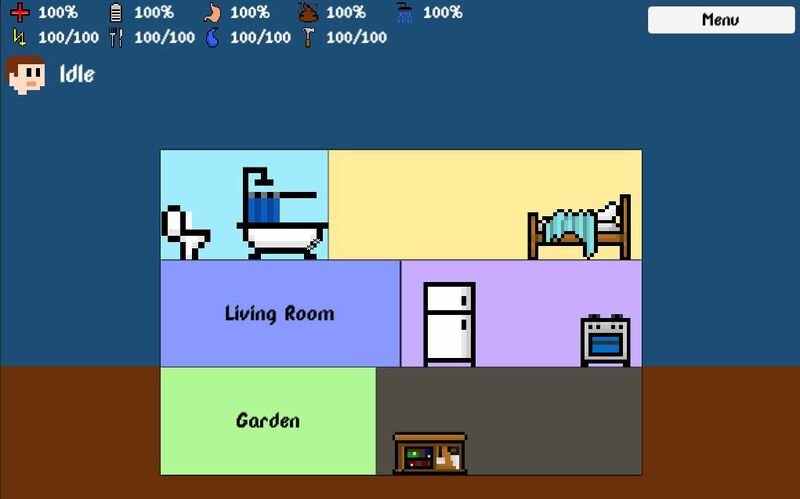 "Building Materials" is the main resource for construction in this game, it’s used in building and upgrading items in the house, can be obtained by working in the workshop. There are more things I’m working on at the moment and also a lot of features I’m going to mention in the next post, like "Scavenging"
Thanks for taking the time and reading. Last time I’ve explained briefly what’s my general idea about the game so far, some aspects might change some new might appear. Recent changes are about the item’s interactions, had to finish them up and apply simple UI for that (tooltip). 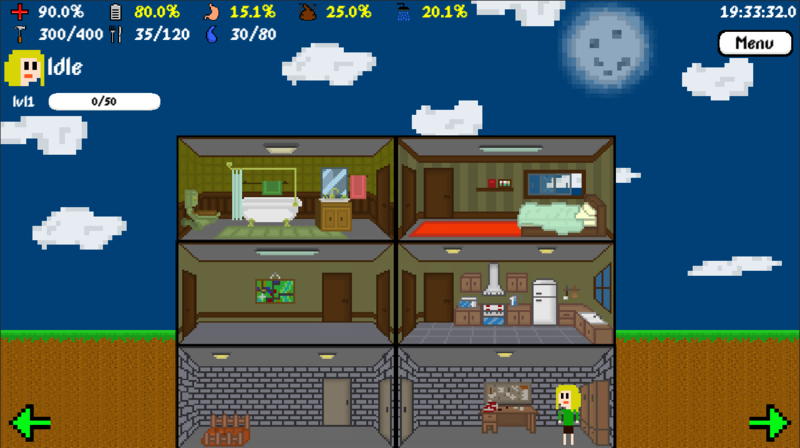 *Apart from that I’ve applied the Resources into the game to be shown and used in updating items. Everything at this point is prone to be changed. 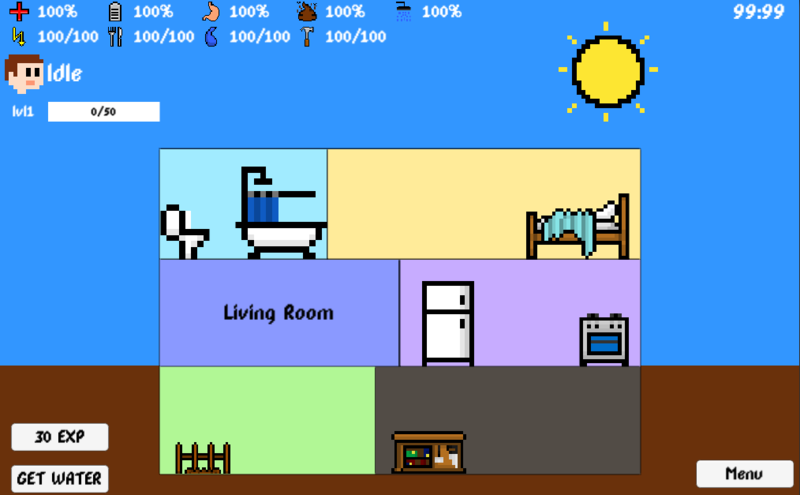 -Implement the power system in the house. Sadly I haven’t been able to complete much the past week, I had some personal errands. 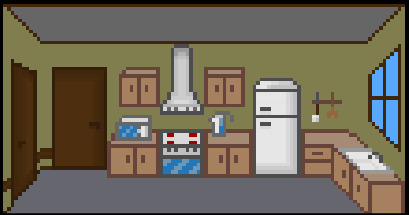 But I didn’t do nothing, I created some pixelart for the kitchen and the workshop. 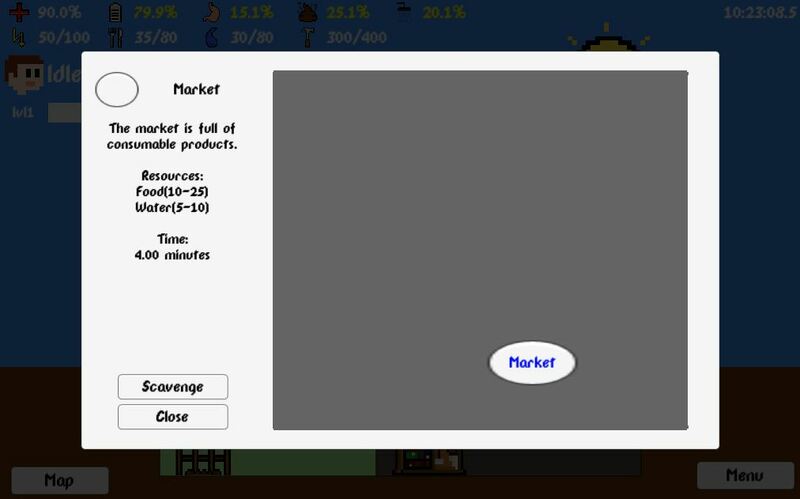 Also I’m half way into the items that produces resources. Hopefully this week I’ll finish up these things and proceed more. I’m two days off from schedule, so many things happening all in all. -Added "Workbench" in the workshop that produces "Building Materials" after finishing a working cycle while it drains energy. I believe soon the first level will reach its first milestone and can have a playable structure, when that happens I’ll publish an early access pre-alpha version online here and on the Google Play. This version won’t be fun I’m just saying it’s just going to be testing out the latest updates and I hope I get more feedback from you guys. I’m coming back to you with lots of updates and I’m getting very close to the initial pre-alpha access that will be put online as an early access. Still very raw things but doing a good deal of progress. For the next part the big thing will be starting with the scavenge system, and creating a map of a city/town . Again it’s barely playable but I wanted to let it be an early access from this stage on. I’ll be adding the PC version here soon too. Having feedback and interactions with you guys would assist with the progress. It’s been crazy two weeks recently, personally and game-wise. I’ve managed to start implementing the initial system for Scavenging. Now you can access a map (which is still raw with dummy graphics) but you can choose a place to scavenge for resources which takes time to finish. The next thing would be to enhance the Scavenge system and proceed with other features regarding the character and the house elements. 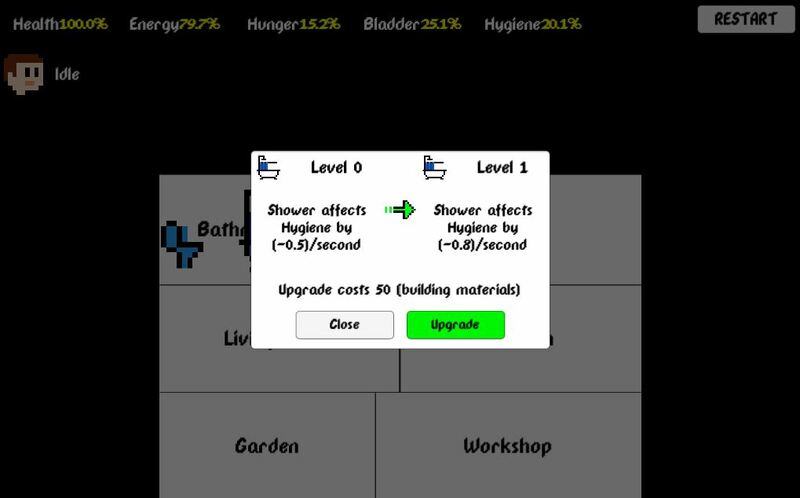 -Fixed the shower info "consume Electricity" into "consume Water"
The current phase of the game's process will focus more on the graphics but I wasn't able to work as much as I wanted. I have been busy with my family coming over and spending time with them. But the progress won't be halted, I've managed to create a new design for the bathroom. 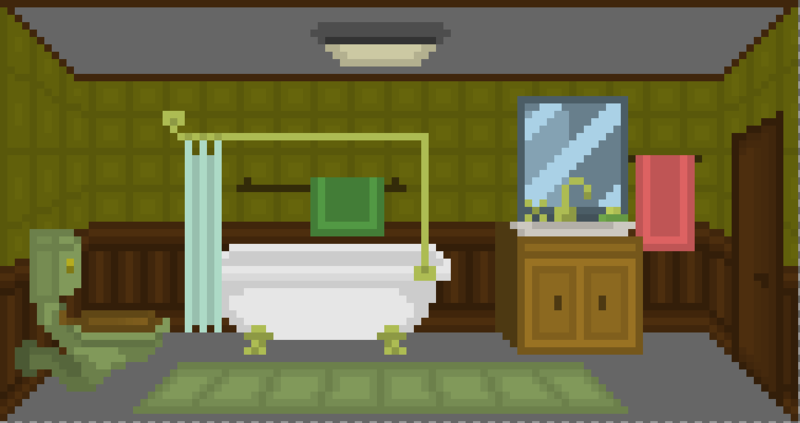 I'm not an expert in pixel-art but I like the outcome of the bathroom. 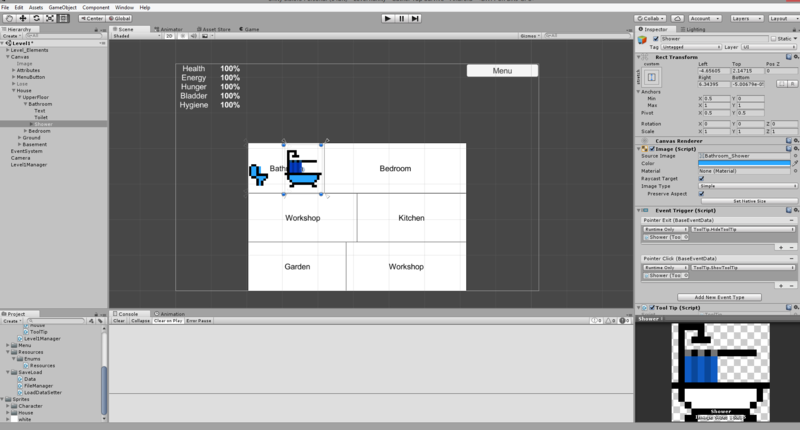 For next update I'll work more on making at least one room design and maybe implement the clicker feature in the game. I’m sorry if I haven’t been able to update more of the game. My family came to visit me for a month and I don’t have enough time to rotate between everything. Though I was able to do something today and yesterday. I’ve created the new graphics for the Bedroom. Again, theses changes aren’t final are open for changing and modifications. 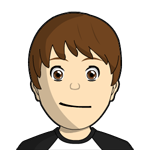 Let me know your comments, I’m not a pro pixel-artist but I love it. The new 0.03 release is online now. Another week with tiny work on GBS but this time I’ve mixed between script and graphics. The biggest addition is the ads in the game, which can help you finish some of the tasks that take a long time. 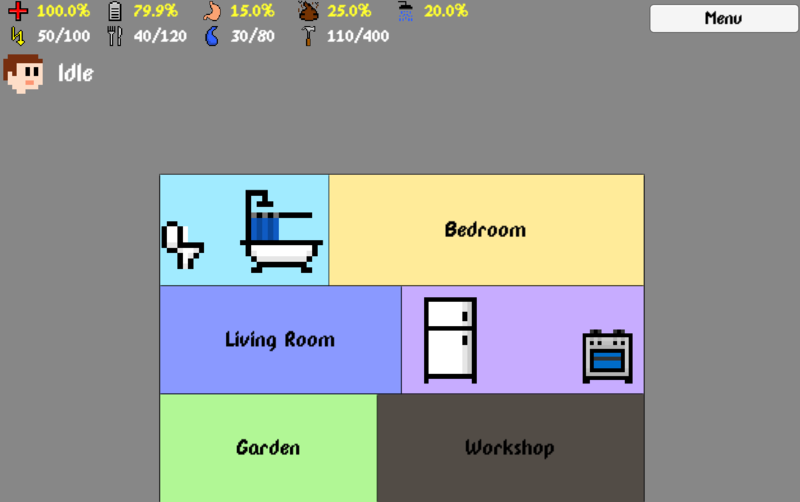 The other addition is the UI graphics, I’ve modified the UI a bit to look more smooth and neat, yet I’ll enhance it later to be much more "neat"
Sadly this version isn’t ready for PC cause I need to modify the Ads to only show in mobile devices and that will be in the next update. Next update I’ll try to implement the clicker feature and make it compatible on PC for gamejolt. I’m back into the game’s dev track. Here’s a new version out 0.06. Just to be clear the build here (windows) isn’t the latest I need some scripting tweaks to make before making a windows version. Finally after a short break I got back into GBS and excited as before and more I’m gladly announcing a new alpha version ready the 0.07.